Disneyland Paris is the experience of a lifetime. 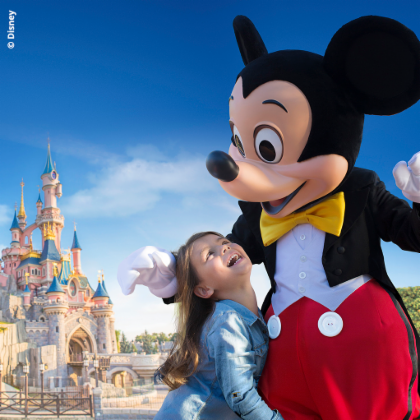 With two side-by-side parks, over 50 attractions, seven hotels, and activities ranging from golf to Caribbean pirate attacks, there's excitement here that will appeal to the whole family.In a magical kingdom not so far away (just 32 km outside of Paris), classic Disney heroes and heroines mingle with modern cartoon superstars - and your family. At Disneyland Park Disney's beloved fairy tales are brought to life in five incredible lands. Your family may experience fun overload, but it's only half of what's on offer!If you choose the 1 Day/2 Parks ticket you can also head right next door to Walt Disney Studios Park. Here, it's Lights! Camera! Amusement! as you get a hearty dose of movie magic. Head behind-the-scenes at four studio lots, meet your favorite Disney characters, and experience thrilling rides. So many rides! Get an idea of the layout before you arrive, especially if you're planning to visit both Disneyland Park and Walt Disney Studios Park. A good plan will help you make the most of your time. All tickets include the fantastic FASTPASS, a free, time-saving service that allows you to pre-book times for different attractions using machines at the entrance to the attraction. This shortens your wait at 2-3 attractions per day, freeing you up to get more family photos with Mickey.